Those knowledgeable of Voodoo know the word for this character. He uses Undead to terrorize those around him and to consolidate his hold on any town! Plans take time. Anyone can move in and just start trying to take over. It takes a real artist to lay out a web for an opponent. The Doktor would be the perfect scapegoat. She thinks sheâ€™s gotten the trust of the town and he attends this and that party. Meanwhile, Huati bides his time. From the governor to the hermit, all come to him regularly for advice, and that old fisherman by the wharf has asked for powder to help aching joints. A little prick here, a few undead seen there... Soon his charms, connections, and political works will see him through. The Doktor thinks she is suave, but she doesnâ€™t know how to play games like a real undead master. Huati is one of the most difficult decks to learn, with the greatest number of Victory Conditions to fulfill: an opponent's Trust has to be 12 or less, and Huati needs enough living minions that their Power and Influence each total 12 along with enough undead minions that their Value totals 12. 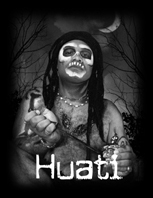 However, Huati is also the only character who can turn minions to undead without losing Trust, if he takes his time (by playing a Zombie Powder from his Reserve). And the Voodoo Doll - just a little prick (all opponents lose one Trust per turn as long as one is in Huati's reserve), but it's enough to unsettle them each time. Other products in the "Horrific" series.